Your business credit score is just as important as your personal credit score. Find out where your state stands. From loans to real estate to insurance -- having a solid credit score can make or break your business. If your business’s score is on the lower end of the spectrum, you’ll likely run into a number of obstacles when looking for funding or applying for a loan. Today, your credit score is a representation of your company’s financial strength. Think about it: Would an investor trust you with $100,000 if you have a bad financial history? Probably not. And when it comes to small businesses, both your business and personal credit scores can come into play -- impacting your business’s ability to get financing. It's important to note, however, that the two types of scores are not calculated in the same ways. Unlike the personal credit spectrum of 850 points, business credit scores are much smaller, typically ranging from 0 to 100 -- scores at 45 and above are considered low- to medium-risk businesses. Of course, factors such as timeliness, number of credit lines and consistency impact a score, but there are also more obscure factors such as location and even local policy climate that can influence a credit score. So if you’ve only been focusing on your personal credit score, it might be time to start checking in on your business score. Nav.com, a site that gives business owners access to their credit scores, examined data from 15,500 of its small-business customers to uncover the top 10 states in the U.S. with the highest and lowest business credit scores. Besides Alabama, it looks like most southeastern states have some work to do when it comes to their business credit scores. 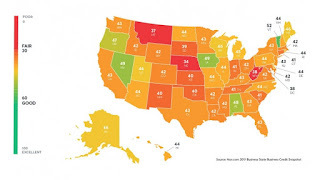 In addition, a number of midwestern states have a long way to go -- maybe they should take it from their neighbor Iowa, which scored number three on the list. 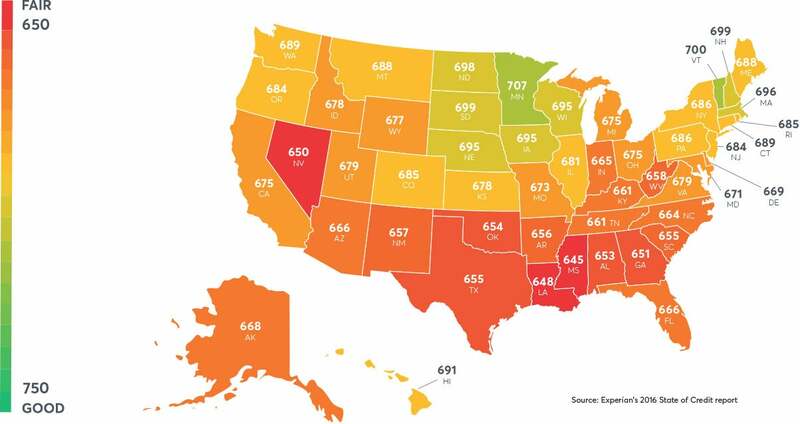 Check out the map below of average personal credit scores per state.